How did the idea of the performance come about? I was familiar with dastans but had never really studied them. My uncle, S.R. Farooqui, has written a comprehensive book on the subject which I happened to read, and found myself hooked to the humour, the drama and the economy of expression. A fellowship with the organisation Sarai followed and I began toying with the idea of making a film on dastans. Last year in May, I got an offer from the India International Centre (IIC) in Delhi to present lecture demonstrations on dastans and realised the best way to present them would be through a performance. Were you sceptical about audience response to the show? I was apprehensive that a non-Urdu speaking audience would not follow the dastans. Besides, it seemed like a challenge to be able to hold the attention of the audience without much dramatic action on stage. However, their reaction surpassed my expectations and I found myself performing to a near ideal audience at IIC. That made me realise this could stand as a show. Subsequently I began to receive similar responses from non-Urdu speaking audiences and even foreigners completely unfamiliar with the language. If you are making them laugh, you most certainly have them hooked. That made me realise that beyond the content, the style of recitation and the form itself were attractive and I found the courage to devise ways to convert even a less than ideal audience to an ideal one. The acting/recitation skills you have used are closer to modern acting styles; is this what makes it more accessible to the audience? Yes. We are two storytellers on stage, though there used to be just one originally. Our delivery is more modern, but I have tried to imbibe the essence of the original art. Even though I haven't heard Mir Baqar myself, I had help from my uncle S.R. Farooqi who has researched dastangoi. In Dehradun we performed in front of Habib Tanvir who gave us some valuable inputs. He has been working with traditional forms for years. I have been trying to strike the right balance between dramatisation and recitation. Our form has been constantly evolving and will continue to do so. Do you see dastangoi as a related but separate performance art form or is it essentially theatre for you? For me, this is most definitely theatre. I am using my body and voice to reach out to a live audience. We need to broaden our definition of theatre. The modern definition built around the proscenium and western sensibilities does not pertain to our context. It leaves a lot of traditional Indian forms out. For instance, it is common practice for Ghazal singers to address the audience directly during their performances asking them to pay heed to a particular couplet. That, according to me, is theatrical. Are your performances a one-off attempt to acquaint people with a lost legacy or do you want to revive this art? I am interested in reviving dastangoi. But I am aware that a stand-alone performance is not enough. A revival would only be underway if more people started performing these stories. Not necessarily in the form I am using, but others could dramatise the dastans or add music to the recitations. The stories can also be contemporised or given a political nuance. For instance, Amar Aiyyar, the hero of our story, could land in Tilism-e-America or Iraq. Even if these performances can generate interest enough for people to buy and read the stories, a sort of revival could be effected. I consider myself contributing more significantly to this revival when I find myself improvising the stories and adding to them in my performances. Traditionally, dastangoi has been entertainment for the masses. Do you think they would be as receptive to your performances as the theatre-going audiences have been? These stories have influenced the earliest writers of Hindi cinema. The masses are therefore familiar with the plots and characters of these dastans. Besides the people of this country are still semi-illiterate which means there is a lot of scope for the oral tradition of stories to flourish. Why is this revival important? These stories were written when self-hatred had not set into our society. They are devoid of colonial influence and marked by unfettered imagination. Fantasies are political because they open up an alternative worlds and possibilities without hammering any point home. These stories are a hallmark of Indian literature. They provide with valuable insights into the history of our languages and writing. It is important for us to discover such independent realms where language can be refashioned and reclaimed from pundits and maulvis. Do you see these stories as unadulterated, non-politicised lessons in history as well? They present a joyous, hedonistic and secular picture of a society with no taboos. There are humorous descriptions of god and saints and references to ‘Islami Sharaab’. These stories were recited on the steps of Jama Masjid, among other places, without any censorship. They reek of a republican spirit and demonstrate the possibilities of critique inherent in our tradition. Copyright 2005 BCCL. All rights reserved. Two men clad in pristine white, surma-eyed, regale a slightly unsure audience with stories of warfare, trickery and sorcery. That’s ‘dastangoi’ for you – a lost form of storytelling in Urdu. Bringing it back and to Prithvi this weekend are Mahmood Farooqui and Danish Hussain. “Dastangos were those who told ‘dastans’ (stories). Recounting tales of Amir Hamza, the Prophet Mohammed’s uncle, they told narratives of his battles with infidels, sorcerers and other pretenders to divinity,” says Farooqui. This performance consists of portions of the best-known ‘daftar’ or chapter, of the 46 volume Dastan-e-Amir Hamza, the Tilism Hoshruba or ‘enchantment that steals away the senses’. “Because this form died out about 120 years ago, we had nothing to draw from in terms of presentation. We’re still evolving the form to suit performance values,” says Farooqui, a self-trained actor from Delhi. One would think that as Urdu is usually considered a language of erudition and poetry, following an entire story in the language wouldn’t be everyone’s cup of tea. “It is only in the beginning of the performance that people are a little hesitant,” says Hussain. Another reason these stories are easy to follow is the fact that the Dastan-e-Amir Hamza, though originally composed in Persian, was translated to Urdu at a time when the demarcation between Hindi and Urdu wasn’t so deep, when most people in northern parts of India spoke a mixture of both languages, says Farooqui. “But more than anything else, everyone loves a good story,” he adds. What is the Dastan-e-Amir Hamza? The tradition of dastangoyee goes back to medieval Iran, where dastangoh or narrators, inspired by the Shahnama (the story of kings composed in verse by the celebrated poet Firdausi), recited tales around camp fires, in coffee houses or even palaces. The Dastan-e-Amir Hamza, which runs into 46 volumes, is ostensibly about the life of Hamza, the paternal uncle of the Holy Prophet Mohammad. At one level, it purports to be an account of the triumph of Islamic armies over infidels and worshippers of other Gods. But in its essence, it is a highly secular narrative. Its modern day equivalent would be Tolkien’s Lord of the Rings, or even Hindi cinema. Its world is fascinating, full of magic and sorcery and tricksters, tilisms governed by fantastical characters and qualities. It is an unstoppable riot of names, places, scenes, descriptions, battles, love-making, seduction. It is really about letting go. How “Islamic” is it? Is it very subversive? In the dastani worldview, good and bad are evenly matched, infinitely. When an evil sorcerer dies, a new one rises to replace him. When someone on the righteous side is killed, another one is quickly found to replace him. Hamza is the lead character, he is the lord of the age. But astonishingly for an Islamic adventure which begins with the rise of Islam, Mohammad is completely absent from the scene. That in itself is intriguing. Also, the freewheeling interplay between people of divinity and people of earthly fame — the Prophets constantly appear in the story to bless Hamza, to give him gifts and boons. The fictionalisation of the sacred in itself could be considered profane. There is also a lot of drinking and whoring and seducing, all very unmuslim things today, except they were very prevalent in the Muslim world at that time. Evil is not really presented as evil. The most likable character in Tilism-e-Hoshruba is actually Afrasiyab — the king of sorcerers. So the differentiation between the Islamic side and the evil side is there in principle and the good side is going to win, but not through right means. There are incidents of trickery in the Tilism-e-Hoshruba which verge perilously on the profane. The false god of the tilism creates Satan in a moment of idle masturbation. He is also said to smell like a toilet bowl because he is too busy serving his people to wash himself. These descriptions are tricky because they could pass for satirical descriptions of the One True God Himself. But the conventions of the dastan were understood. They were meant purely to entertain. What is the epistemology of dastangoyee? Dastangoyee as a form of narrating dastans has been around for some time. But in 19th century Lucknow, the dastan gets indigenised. It is about four things: Razm — warfare, Bazm — assembly of singing, dancing and seducing, Tilism — magical effect or artefact created by the sorcerer, and Aiyyari — chicanery, trickery, disguise. The aiyyars, the tricksters, are employed by both sides. Conventionally the Hamza dastan is the most popular, but what used to happen is, for instance, on the steps of the Jama Masjid every Thursday there would be all kinds of dastangohs and they would be narrating stories. So when Mir says, “How would you understand my Urdu, you have never been to the steps of Jama Masjid?” he isn’t talking about the Masjid per se but about it as a site of performance and a repository of spoken and written languages and Urdu poetry. Is the evil side of a certain race? Obviously, they are fire worshippers; they are Parsis by religion but Hindu by appearance and description. They are magicians or sorcerers called jaadugars or sahir. The dastan is a fantasy and the more fantastical it gets the better it is. For instance, in Tilsm-e-Hoshruba (Hoshruba meaning that which takes away your senses), Afrasiyab has 60,000 kings under him. He has cast two tilisms. One hidden, one manifest. Between them runs a river of fire — Khoon -e- Rawaan — with flowing blood. On that is a bridge made of smoke. In that smoke stand two lions. On top of that smoke is a three-tier building. In the first tier fairies play flute. In the second they are throwing pearls in the river and the fish in the river are holding those pearls and swimming about. In the third tier are the habshis, the Negroes from Africa fighting each other with naked swords and their blood is falling into the river. This inventiveness and unhindered, unfettered run of the imagination is impossible now. Our imaginations are now circumscribed in a certain way by the laws of possibilities. Though dastan is a literature supposedly created by Muslims, the Muslims they describe would be unrecognisable to many Muslims and others today. Its understanding of Islam is centuries old, and it was repeatedly recited in chowks, palaces, streets. And people enjoyed it. It is the last vestige of the unreconstructed public order in India. It is a culture anterior to colonialism. The treatment of the body, sexuality, free run of sexual speech, abuses even between an emperor and an aiyyar, the bawdiness of our civilisation is very much evident. All of which is completely taboo today. You said the Hamza dastan was indigenised here. How different did it become in India? The Hamza dastan exists all over the world, but as a single volume story about Hamza’s battles. In Lucknow, Hamza is sidelined. Aiyyari and tilism come into their own. The dastan runs into 46 volumes! It becomes completely indigenised, so much so that it contains all the stories we’ve ever had in our country so far. It had an omnibus linguistic style, it was borrowing from anyone and everyone. Dastan-e- Amir Hamza is a kind of katha saritsagar where all kinds of stories flow in. You have Betaal Pachisi, Panchtantra, Alif Laila… It is a climax of two or three thousand years of oral storytelling in the Indic tradition. And in the Indic and Central Asian traditions there’s a spiralling loop feeding into each other. The Hamza dastan doesn’t tell about a character’s destiny, it has no interiority. It is telling a masala story to be enjoyed. Why did it fall out of use? Perhaps the most amazing story about the dastan is the story of its neglect. To investigate that is to investigate a story of cultural politics, of how our literature, literary histories and literary conventions were modified by colonial interventions, active and indirect. It is a story about reconfiguring our half-split colonial modern selves. Why is it that dastans don’t occupy a prime position in the Urdu world? Why is it that a lot of non-Urdu speakers know about Ghalib and Mir but do not know about dastangohs? These are printed texts. Why have they vanished? The Hamza dastan was finally printed by Naval Kishore Press between the 1880s to 1910. It was written by a group of dastangohs. The first three volumes of the Tilsm-e-Hoshruba are written by Mohammad Hussain Jah. But they don’t say we are creating this story; they say we got it … Faizi wrote it, Khusrau wrote it, Firdausi wrote it. Its structure is Urdu poetry and Hindustani classical music where you have a given parameter and you improvise on that. It is created by a collective imagination. And until it was printed, it kept evolving, much like a piece of jazz. But these performers are no longer around in our public realm. Our public space has been recast. Finally, how did you come across it? I was born in an Urdu literary world. One had heard about the Hamza dastan. My father had one single volume and he used to say, read it, it will improve your Urdu. I was amazed by the freshness of its language 120 years after it was first printed. Then SR Farooqui, perhaps the only person in the world to have the entire collection of 46 volumes, urged me to start performing it. I kept dawdling for a long time until Sarai stepped in and made it possible for me to study, read and write about it. But it was the people at iic (New Delhi) who finally made me perform, so I am eternally grateful to them. The response was amazing. It was one of the most outstanding moments of my life. On a soft autumn evening in New Delhi recently, in the back garden of the IIC, I was witness to an unusual and dramatic performance. It was an oral narration in the traditional style of Dastan-goi or Kissa Khwani - that rare art of story-telling, revived that enchanted evening by two talented young performers, Mahmood Farooqui and Himanshu Tiyagi. Sometimes separately, occasionally in unison, they recited the dramatic text in a manner that held their audience spellbound for almost two hours. They were dressed identically in white kurta pajamas with muslin caps, in stark contrast to the night-black stage drop. The two performers sat in the fore-stage, close to the audience, on a simple masnad with bolsters, and used only the minimal props of a few miniature paintings to create an old world atmosphere. The passages they had selected for recitation that evening came from the epic dastan- Tilism-e-Hoshruba – which in its time was I suppose was the equivalent of the modern fantasy Lord of the Rings. I had read the Tilism-i-Hoshruba countless times since I was an impressionable ten-year old. I knew each phrase and every dialogue in the text almost by heart. Its oral recitation held me enthralled, for this was in fact the first time that I had heard the dastan being recited, as it was intended to be when it was first popularised. What surprised me was how a modern audience in Delhi, many of whom were hearing the text for the first time, seemed to be equally captivated. I noticed from their reactions that they were following the devious Amr Ayyar as he looted and pillaged the fabled city of Napursan. They relished his hilarious encounter with Afrasiab Jadoo (the king of wizards). They shared the tender descriptions of the two lovers – Afrasiab’s niece Tasveer and Prince Badi uz Zaman - who like traditional lovers were consumed by the flames of love at first sight. The Tilism-e-Hoshruba, like every grand epic, is a long narrative. In its original form, it consists of seven volumes and constitutes only one of the daftars or chronicles of the Dastan of the legendary hero Amir Hamza which itself runs into forty-six daftars. The tradition of dastan-goi goes back to medieval Iran. There, dastan-gohs or narrators, inspired by the Shahnama (the story of kings composed in verse by the celebrated poet Firdausi), recited tales around camp fires, in coffee houses or even palaces. They spoke of fearless princes who with the help of tricksters called Ayyars fought evil kings; encountered and vanquished demons, magicians and jinns and of course they courted beautiful princesses, magical enchantresses or the female parizads. The Dastan-e-Amir Hamza is ostensibly the life of Hazrat Hamza bin Abd ul Muttalib, the paternal uncle of the Holy Prophet Mohammad. Hamza had the reputation of being the strongest man of the tribe of Banu Hashim and fiercely protected his nephew against his enemies from the tribe of Quraish. He followed the Holy Prophet after he migrated to Medina from Mecca. Hamza was killed in the Battle of Uhud by a slave who had been promised his freedom by Hind, the wife of the powerful Quraish overlord of Mecca, Abu Sufiyan. The romance of Hamza may have originated from the story of another Hamza - Hamza bin Abdullah, a Persian rebel opposed to Khalifa Haroon-ur-Rashid. His equally exciting exploits and adventures were the source of many stories that could have been grafted onto the Arab Hamza, thus creating a super-hero who for being the uncle of the Holy Prophet was more acceptable. Not surprisingly, the tales of the Hamza spread all over the Islamic world - from Anatolia to Indonesia and were translated and narrated in many local languages. They so captivated the Mughal Emperor Akbar that he recited them himself in Persian and also commissioned his atelier of artists and calligraphers to illustrate the popular text on an imperial scale. The final manuscript consisted of over a 1000 illustrations. For the next three months of my pre-teens, I breathed and lived within the pages of the Tilism. I followed Amir Hamza Sahib-qiran (Lord of the Auspicious Conjunction) as he followed Zamurrad Shah Bakhtri (a Persian king who claimed divinity), to the mountains of Kohistan. I went in the footsteps of Hamza’s grandson Asad Sherdil as he invaded the Tilism and came across a garden whose trellised white gateway was open “like the arms of the beloved.” I was overawed with the powers of Hamza as he breathed the Great Name on the corpse of his slain son that turned out to be made of lentil flour. I was riveted with the antics of his companion and trickster Amr who could assume any disguise and outmanoeuvre the most powerful wizards with the help of Galeem,(the cloak of invisibility) and Zambeel, (the pouch that contained a whole world); magical gifts that had been bestowed on him by the prophets. That evening at the IIC brought the magic of the Tilism back to life. Hearing the partnership of the two modern Dastan Gohs made me realize how much our present society has been impoverished by relying on watching myths and fables of cultures other than our own into films or compressed into CDs. The whole charm of these dastans was that the audience was an active component of the narrative. By imagining the events being narrated from the stage each member of the audience was in effect picturising the action individually in his or her own mind. That night for me, as I have been translating the Tilism into English here in Lahore, the city of Delhi - the City of Djinns - became the city of Agate and Ayyars, and the IIC garden transformed into the Garden of Pleasure. VISUALISE the setting from The Great Indian Laughter Challenge-a bare stage, an audience enraptured by a group of individual storytellers. Then replace the wannabe comedians, Suman and Sidhu, with a couple of orators in white kurta pyjamas and qawwal topis, who transport you to the medieval times with their eloquent speech, antique mannerisms and magical tales about the battles of Amir Hamza, the Prophet Muhammad's uncle, against infidels, and sorcerers. The performers, Mahmood Farooqui and Danish Husain are the champions of the forgotten technique of Urdu oral recitation known as dastangoi. ''It was a popular occupation at masjids, chowks and muhallas till the start of the 20th century where dastangos recited chapters from the Dastan-e-Amir Hamza. This piece we are doing is from the Tilism Hoshruba, the most popular and famous chapter and we're performing about 25 pages from it,'' says Farooqui (34), who first embarked on a crusade a year back to rediscover the art of storytelling. Armed with an MPhil in Urdu literature, he conceptualised the performance a year ago, as a tool to revive the art form and entertain. ''We're trying to make it more interactive instead of just reciting, with more actions, expressions and some movement,'' adds Farooqui. Not much is known about the authentic dastangoi form. In collaboration with scholar SR Faruqui, an authority on the topic and thespian Habib Tanvir, the stories have been brought to life, while maintaining its distinction from theatre. ''The texts have been so marginalised that not much is even available to read, but it's challenging because it removes the other elements of theatre and leaves only the words,'' says Husain (35), also a member of Tanvir's cast of Agra Bazar. Like in the original form, the duo try their best to memorise the lines and then improvise. Though sittings have been known to stretch across days, they've never gone beyond two hours. Apart from the opening night at the NCPA, they've also been invited by Naseeruddin Shah's Motley production to stage dastangoi under their banner. With revived interest in dastans, Penguin books is publishing a translation of the Tilism-e-Hoshruba, while Sagar Arts is working on televising the same. Farooqui's also researching a documentary on the subject, one of his many ways of rescuing the tales from annihilation. The 46 volume Dastan-e-Amir Hamza is one of the longest prose narratives anywhere in the world. Its publication followed the centuries old practice of oral recitation of the story. Today though this monumental work and the art of its recitation, Dastangoi, have become wholly marginalized. It was the most rewarding evening of the season at the Centre on 4 May last. The tradition of the story teller, the Dastaan-Go, which had gone into oblivion, was re-enlivened. 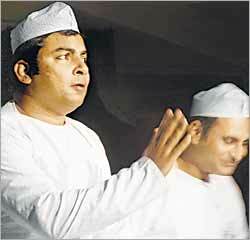 Mahmood Faruqi and Himanshu Trivedi, dressed in the traditional attires of a Dastaan-Go, appeared on the stage. With their gestures and expressions, they transformed the whole atmosphere in the hall. The elegant metaphorical Urdu narratives, interspersed with verses, were sensitively reinforced by the movements of eyebrows and facial expressions. Appropriate to the occasion, there were slides of the paintings of Hamza Nama, which had been commissioned by Emperor Akbar in the sixteenth century. Two introductory lectures preceded the Dastaan-Goi. William Darymple spoke first, on the oral traditions of Rajasthan, followed by Shamsur Rahman Faruqi who spoke on the tradition of Dastaan. He particularly elaborated on the Dastane Amir Hamza, a dastaan stretching into 47 large volumes, a small part of which was retold on this particular evening. Dastaan has been one of the most popular genres in India’s oral tradition. In a Dastaan, stories are intricately woven within stories, developing the mystery from episode to episode. The mystery, while appearing to be solved, creates further mysterious situations. Thus the mastery of the Dastaan Go, or story-teller, over his craft is proved by his skill to keep the already awe-struck audience under his spell according to his will. The Dastaan Go lays a trap, woven only by words, to catch the imagination of the listeners. For different types of listeners he innovates different strategies. Famous Dastaans have been known to have continued night after night. The Arabian Nights was originally known as Alf Laila wa Laila, which means one thousand and one nights. The original Dastaan is in Arabic and is said to have been narrated continuously over one thousand and one nights. Story telling is as old as human civilisation. Stories were passed on from generation to generation. Most of our heritage-knowledge, religions and philosophies and tales of valour of hero and heroines, social customs which have come down to us, have been preserved in memory and transmitted to later generations orally. Also, travellers, rural folk, urban elite, Kings and courtiers found a good pastime in Dastaan. The origin of a large number of theses stories is not traceable. The make- believe landscape in which these stories grow is the product of the imagination of the story teller. Flights of fantasy lift one into the land of fairies and ghosts, into the company of Saints and Divine, courts of the King. The magic would easily transform immediate settings into hell or heaven. The beauty of such stories lies in the style of the narrative. The same stories have been told and retold for centuries. Each time a story is told, one finds a certain freshness in the rendition. The story teller is fully within his rights to mix up the episodes of various stories and add any thing from his own imagination. The essential element is the effort to perpetuate mystery while the listener’s expectation has to be kept up by bringing in astonishing events one after the other. The curiosity of the listener is never allowed to be satisfied. There were professional story tellers who carried on and perfected their craft. Some of them became as popular as poets or preachers. The story goes that once a Dastaan-Go was employed by the King. He was portraying the emotions of a separated lover waiting for his beloved, when came the news from home that some one was seriously ill. The Dastaan-Go called his son and asked him to continue till he returned. When the father came back after a month he found the son still narrating the restlessness of the lover waiting for his beloved! With the advent of the written word, these stories were documented, but at a very later stage. The tradition of the Dastaan-Goi survived until the early twentieth century when cinema became popular. Leisure was an essential prerequisite for the Dastaan, that slowly began to vanish from people’s lives. Most of the Dastaans were published in the nineteenth century and were popular among the educated up until the recent past. Qissa Char Dervesh and Fasaana-e-Ajayab still occupy a place of honour in the syllabi as examples of classical Urdu prose. It has enchanted both the prince and the pauper. From the court of Akbar in Fatehpur Sikri, to the Qissa-Khvani Bazaar in Peshawar, to the by-lanes of old Delhi,‘dastans’— symbolising the perfect bonding of literature and performing art have not only entertained people since time immemorial,they have been an outstanding example of prose narration in Urdu. But in what might be considered as another instance of cultural neglect,this art of story telling, where the narrator used to perform the characters through voice modulation, mimicry, ventriloquism and spontaneous composition, has sunk into oblivion as today there is no expert, book or account that can shed light on this remarkable tradition. It is the vitality of the text and the elements of creativity and improvisation in performance which attracted young theatre artist Mahmood Farooqui into the magic world of dastans and the dastangois or the narrators. Presently working on a research project, this Rhodes scholar is trying to revive the “culture of story-telling” by ensuring that this unique form of verbal art gets its rightful place in Urdu cultural tradition. Through his project, that includes translating a few volumes of dastans, performing them at stage shows and making a film on the art form, Mahmood sets a “modest” goal for himself— revivification of interest in the craft. Elaborating on the nature of this unique art form Mahmood says, the word dastan means a tale, but longer than a qissa. Thus, a dastangoi might carry on for days and weeks telling stories. Originally composed in Persian, versions of dastans gradually spread to all languages of the Islamic— from Indonesia to Azerbaijan, East Bengal to Constantinople. The most famous of these purported to deal with the life and adventures of Amir Hamzah, the Prophet’s uncle. “The stories had a moral— victory of the righteous over the sinner. But even the righteous had his pitfalls showing that to err is human and there is nothing like a perfect human being,” says Mahmood. Popular in India since the eleventh century, the art form acquired immense prestige because of emperor Akbar’s personal interest in it. He not only memorised great portions of the story and used to recite and perform them with élan, he also commissioned an illustrated version of it, the great Hamzanama, regarded as the crowning glory of Mughal Art. However, the dastan came into its own in India only in the 19th century when it began to be composed in Urdu. The “Indianised” dastans had a lot of common elements and storylines with the Ramayana, Mahabharata, Jataka and the Panchatantra. For example, the story of Ram killing the demon Marich, who was in the disguise of a golden deer, had been modified in a number of dastans. In 1881, Munshi Nawal Kishore, the legendary publisher from Lucknow, decided to come out with a multi-volume edition and in 1905, the 46 volumes of the Dastan-e-Amir Hamza were published. But more interesting than the text was its narration as the dastangoi used to recite the stories along with the sub-plots from memory and the quality of his performance used to depend on his capacity to improvise. Their performance required exceptional command over rhetoric, delivery, mimicry, ventriloquism and spontaneous composition. Moreover, dastangoi was one aspect of an oral/performative culture where the public arena — market place, roads, chowks, was the first and perhaps the most natural site of performance. “For example, when a dastangoi used to perform in front of a kebab shop in old Delhi, he used to select his stories according to his audience. Since there was no stage, no dazzling costume and no music, the narrator used to chose the language, words and poems in such a way that he could hold the attention of his audience for a long time,” says Mahmood. Citing the example of the last famous dastangoi of India Mir Baqr Ali, Mahmood says, “While he was reciting the dastan, if a king appeared in the story, the listeners felt themselves standing before an imperious monarch. Sometimes, if he spoke the words of some old woman, he adopted the very style of speech of respectable elderly ladies, as if he does not have a single tooth”. Whenever, the story had a description of a marketplace, the narrator used commoners’ language. But soon after the narration might have a court scene and the dastangoi would switch over to sophisticated Persian with equal élan. Although dastans continued to be published till well into the 1940s their popularity, both as a printed story and as a live performance, had clearly waned. While changing times might explain the decline of the form, what is inexplicable is the way their memory has been virtually effaced from our literary and performance history, says Mahmood. Though the main stories were based on the tours of Hamzah and his family to far off lands, ostensibly in the cause of Islam, the sub-plots also included secular activities such as wining, seducing, abducting and the amorous affairs of men and women.